sometimes life is plain unfair. Ok. What I am about to share is not that deep but I was somewhat in the zone. I love butterflies! They remind me if my childhood. We use to have a bush of purple flowers in our backyard where butterflies would come dance and play. Since city life doesn't really give the luxury of garden and such, I made my own. I have herbs pot, hibiscus with purple bush around them. I wanted to attract butterflies... they never came. 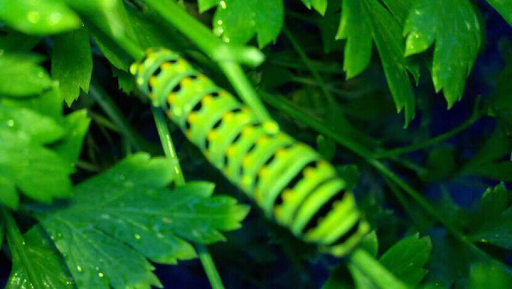 Until this morning, I walk outside to check on my herbs to find that my parsley were infected with caterpillars. Big caterpillars, small caterpillars, caterpillar's eggs all over. I wanted spray them away, then I remember they might morph into butterflies pretty soon. So I held my breath and let them eat away at my tender parsley bush. 3days later I checked again they were gone! Leaving half eaten parsley stems. and their little creeping self no where to be found! Darn ingrates! They could at least say: "hey! Thank you for your hospitality, we're going in our cocoons now, we'll fly by you later "
Does this sound like some people? All I wanted was some darn butterfly!